Seasick Steve premieres his new single Sun On My Face - track taken from his upcoming album Can U Cook? Seasick Steve has released a stream of his new single Sun On My Face. The track has been taken from the vocalist and guitarist’s upcoming album Can U Cook? which is set to arrive on September 28 via BMG. Can U Cook? was produced and written by Seasick Steve, with the majority of the record recorded in a converted ice house on the dock in Key West, Florida. He's joined on the album by his longtime drummer Dan Magnusson aka Crazy Dan and guitarist Luther Dickinson of The North Mississippi Allstars, and formerly of The Black Crowes. 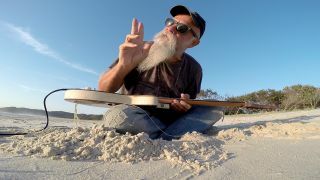 Along with the stream, Seasick Steve has also released a montage video to accompany an excerpt of the track. Can U Cook? will be available on CD, on digital platforms and on limited edition clear vinyl. Seasick Steve will tour across the UK in support of the album, kicking off in Cambridge on November 9 and wrapping up with a performance in Glasgow on the 21st of the month.